MSI delivers two new Full HD gaming laptops; the 17.3" GT780DXR series and the 15.6" GT683DXR series. There are two models of each laptop, they all offer the Intel Core i7-2630QM processor, NVIDIA GeForce GTX 570M graphics, 802.11b/g/n WiFi, memory card reader, USB 3.0, a 720p HD webcam, HDMI, and 9-cell battery. The GT780DXR series offers a SteelSeries gaming backlit 103 keys keyboard while the GT683DXR has to do with a regular 103 keys chiclet edition. Other difference between the models are the memory (16GB DDR3 or 12GB DDR3), storage (2x 750GB or 2x 500GB) and Blu-ray/DVD burner. Prices range from $1,699.99 to $1,999.99. 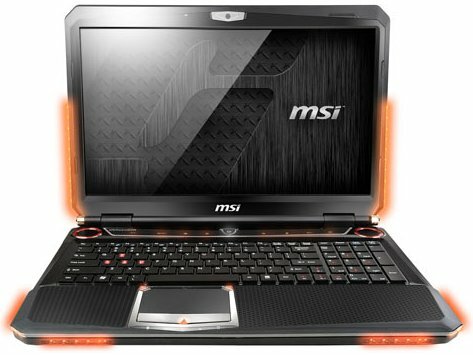 MSI Computer Corp, a leading manufacturer of computer hardware products and solutions, unleashes the GT780DXR and GT683DXR, two mobile gaming powerhouse laptops featuring the NVIDIA© GeForce© GTX 570M graphics processing unit (GPU) and optional Blu-ray burner. Part of MSI’s renowned G Series family of gaming laptops, the new units are designed for the serious gamer seeking unmatched power with an unprecedented immersive experience. Leading the fleet, the GT780DXR comes in a brushed aluminum chassis with 17.3-inches of Full HD Non Reflection display and SteelSeries programmable backlit keyboard. In addition to its high performance NVIDIA© GeForce© GPU and Intel® Core™ i7 processor, the gaming workhorse is supported by 12 GB of DDR3 system memory and 1TB of hard disk with Raid 0 or no redundancy. For gamers craving even more dominance, the unit can be amped up with Blu-ray burner, 1.5TB of hard disk and 16GB of DDR3 memory. All models are protected by a 2 year Manufacturer’s Limited Warranty starting at $1699.99 MSRP on Newegg.com and Amazon.com.